This year, we include rural farmsteads, log tabernacles an cabins and county schools on our list. These pioneer building types represent vernacular architectural forms and uses that define our rural landscapes. These building types are often taken for granted, if noticed at all. They are often invisible from the main road, or located in a small out-of-the-way communities with limited resources. Usually built of locally available materials, the skills needed to maintain and preserve them can be taught again. 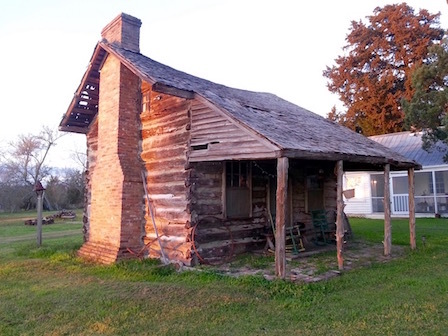 The Cavitt Log Cabin is a circa 1836 log structure built during the Republic of Texas era in need of restoration represents the threat faced by log cabins across Texas. The Library of Congress has measured drawings of the Cavitt Log Cabin online. Click here to view.